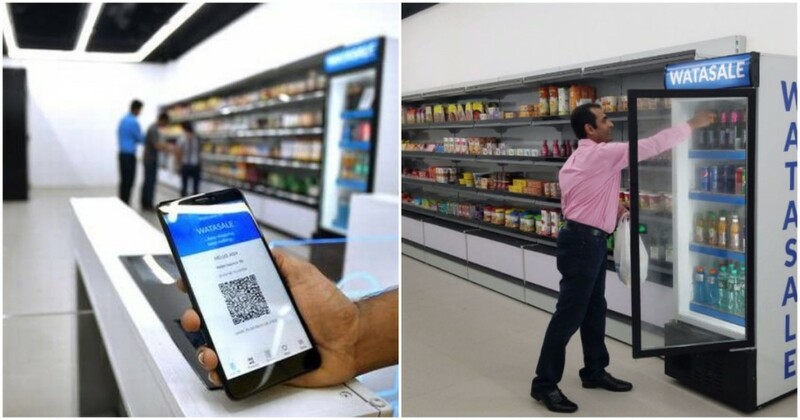 India’s big retailers have been trying to get all futuristic in recent times — Future Retail has said it’ll soon allow customers to order through WhatsApp and Facebook Messenger, and Reliance Digital now has an e-commerce website. But these steps pale in comparison with what a little known startup from Kerala appears to have created — it’s gone ahead and opened a store that’s completely autonomous. Watasale’s first retail store, which opened in the Gold Souk mall in Kochi last week, has no cashiers and no payment counters — customers can simply pick up their purchases and walk out. Before entering the store, customers need to download Watasale’s app, which provides them with a unique QR code. They can then enter the store by swiping the QR code at the entrance. Once inside the store, they can pick up the items that they need, and sensors automatically determine the items that they’ve picked. After they’re done, they can simply walk out — their bills are charged through the payment method linked on their apps. It might sound like a futuristic fantasy, but Watasale isn’t the first company to come up with stores like these. In January this year, Amazon had opened a test store in Seattle called Amazon Go around the same concept. Watasale seems to be a remarkably close approximation of what Amazon managed to do. Its first store is sparse and clean, and has two columns of shelves that stock eatables, everyday products, and even beverages. It seems to be able to perform several tasks that were thought likely to trip up such stores — Watasale customers, for instance, can keep items back on the shelves that they’ve picked up by mistake, and the store smartly determines that they haven’t purchased them. The store also has a refrigerated section with drinks, and Watastore can still accurately determine which item has been picked. Watasale has been relatively tight-lipped about how its technology works, but the store’s ceiling is black and lined with cameras and scanners. The founders say that computer vision is one of the techniques through which they can determine which customer has picked up which item. It also says that it uses multiple sensors for “pressure, stress and light sensing”, as well as deep learning and big data. It’s a pretty remarkable achievement for a small startup to have a fully autonomous store up and ready in India, a mere 9 months after Amazon opened the first Amazon Go store. Amazon now has opened three Amazon Go stores, and Watasale too says that it can expand its stores in other locations as well. Watasale’s founders don’t seem to have fancy degrees or big VC backers — its CEO and CTO Subash S has a degree in Electronics and Communication from NSS College of Engineering in Palakkad in Kerala, and Chief Information Officer Shanoop Sivadas has a BTech in Computer Science from Government Engineering College, Idukki. But without much fanfare, Watasale seems to have quietly created — and launched — what looks like the most advanced retail store in India.